The New Gen V2 Pop-in is made from gorgeously soft and incredibly absorbent inners and the outer shells come in these amazing colours and prints! The Pop-in is an all-in-one nappy system. 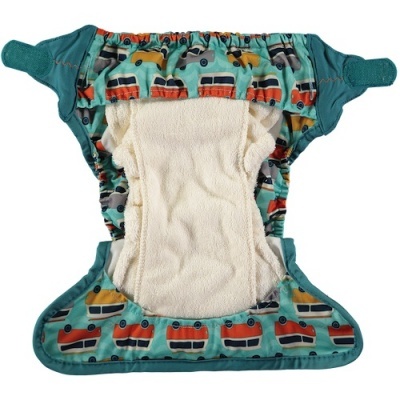 It comes complete with a soaker and a booster popped together in a clever waterproof outer shell. They have stretchy tabs like a disposable for a soft snug fit around baby. 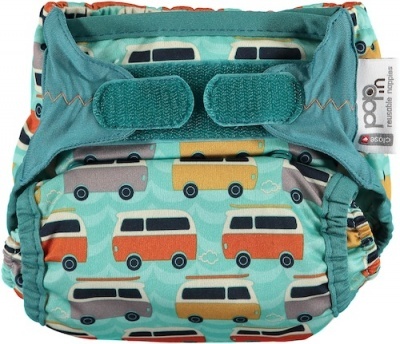 There is a double leg gusset for extra protection against leaks and finally Pop-ins have a wonderfully absorbent panel concealed within the gusset of the outershell which helps hold the wetness in the middle of the nappy so parents get that extra dry time between changes. So what's new with the Pop-in NEW GEN V2? Well for starters, the rear wash tab has been replaced with a unique and innovative hidden tab system. The elastic at the back of the soaker has been removed to speed up drying whilst the back poppers have been replaced with tab poppers, for improved comfort. Other small modifications to the elastic and sizing ensure äóÖNEW GEN V2' provides a softer and more flexible fit on baby at all ages and stages. Bamboo is the fastest growing plant in the world and is grown naturally, without industrialised farming. It is sustainable, and thrives without pesticides or fertilizers. It is 100% biodegradable, cuts like grass and re-shoots without being uprooted which means it can grow in places where other crops are simply not viable.